Make a cloud to show the changes of state and it uses the 3 states of matter. First: Pour 1/2 cup of boiling water into a jar. Then: Add 6-10 ice cubes to a metal or foil pan. Next: Set the foil container with the ice on top of the jar. The hot water in the bottle causes warm wet air called water vapor. The warm wet air rises to the top of the jar. As it reaches the top of the jar, it meets the sinking cold air created by the ice cubes. The cold air then cools the warmer air and this creates the water it was carrying to condense into tiny droplets. As the warm water vapor cools and condenses a small cloud forms. 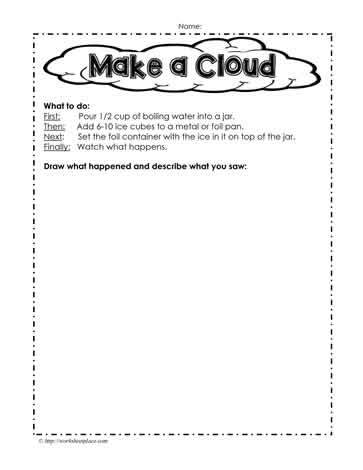 Use the cloud making activity to discuss water’s three states of matter. This activity will also work with a soda bottle and ice balanced on the top.